THE COUGS DIDN'T COUG IT! Oh, they TRIED to Coug It, giving up a couple touchdowns on returns, including one that gave Rutgers the lead with less than two minutes to go. 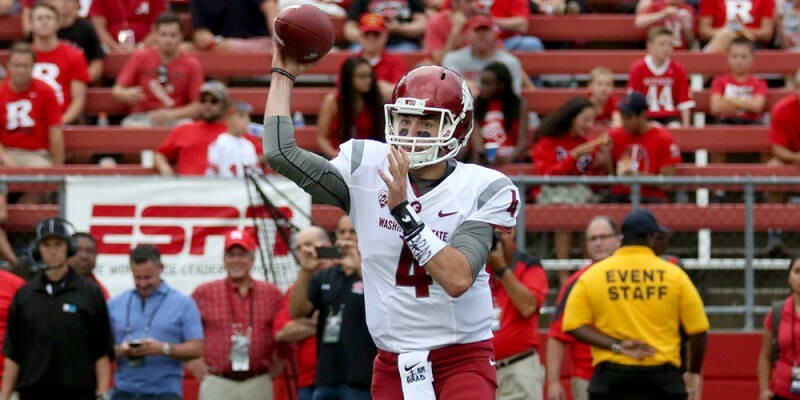 But thanks to Falk, who had a monster day with nearly 500 yards passing and four touchdowns, questions about Coach Mike Leach's future and whether or not the Cougars will win any games in 2015 can be put on hold. At least for another week. They play Wyoming on Saturday. There is nothing wrong with going on the road against Northern Iowa and coming away with a loss. The Eagles have actually done that several times — they are now 0-6 at UNI's "UNI-Dome" after losing a barn-burner 38-35 on Saturday. While it might be frustrating to lose a game in which quarterbacks Jordan West and Reilly Hennessy combine to chuck the rock for more than 500 yards, when a team can only run for 26 yards, that's a problem. The Eagles will need to find some offensive balance moving forward into Big Sky play, starting Saturday against Montana State. More concerning than a loss to a Top 15-ranked UNI was the loss of All-American receiver Cooper Kupp at halftime to a hip-pointer. He caught 179 yards' worth of passes before halftime and might have helped the Eagles steal this one, but if Kupp can't play at his usual level this week and beyond, the Eagles prospects might change from national title contender to something, um, less than that. Stay tuned. Not much chance that anything good was ever going to come from the University of Idaho's Vandals traveling to play USC in Los Angeles, save earning more than $1 million for the "effort." The Trojans squeaked by UI by 50 points, and it wasn't really that close. This came came on the heals of news that the Idaho players who ripped off the university bookstore had been identified, and included star receiver Dezmon Epps. Epps was held out of the game by embattled Vandals Coach Paul Petrino. The Vandals gave up 738 yards of offense to USC. That is, as they say, not good. Up next for the Vandals is Wofford on Saturday. Just as Seahawks fans maybe — maybe — are getting over the traumatic effects of what happened in the Super Bowl, the new season opened with a bizarre loss on the road to the St. Louis Rams. The loss wasn't totally unexpected. The Rams have a great D, and they beat the Seahawks at home last year, too. But the way Seattle lost this one must have driven the 12s crazy. First there was the elation of the 'hawks fumble recovery taken in for a touchdown to take the lead late in the fourth quarter. Then there was Rams QB Nick Foles tossing a 37-yard TD in the last minute to get the game to overtime, thrown over the replacement of holdout Seahawks safety Kam Chancellor. Ouch. Then, in overtime, the Seahawks started off with a was-it-or-wasn't-it onside kick that the Rams recovered and quickly turned into three points. Seattle, needing at least a field goal to keep the game alive, drove into the Rams territory until they found themselves with a 4th-and-1 to go. Hmm, what would the Seahawks do when needing one yard to keep the game alive, and perhaps march toward victory? Will they give it Marshawn Lynch, their backfield beast? Or will they do this again? Well, they gave it Beast Mode, he got stuffed, and the Seahawks are now 0-1. Next up? A game at Green Bay next Sunday night. At least that game has more pleasant memories for Seahawks fans.